The effective combat strength of the National Army (Ejército Nacional) is considerably less than that suggested by the total strength figures. Despite having a total of 226,352 members in 2008, well over half of the army, or 128,818 personnel in early 2009, could not legally be used for combat duty because they were serving their obligatory military service. In 2008 the army ranks included approximately 7,000 officers and 26,000 NCOs. The general commanding the army is assisted by a staff consisting of a chief of army operations and an inspector general. The army deputy commander is also the army chief of staff. This general oversees the directorates of planning and information and coordinates operations, logistics, human development, and education and doctrine. In the 1960s the insurgency problem in Colombia was almost exclusively a Communist problem. The Communist guerrillas, however, were not a united or even a coordinated force. Three separate and mutually antagonistic Communist guerrilla movements existed: the Soviet-oriented Revolutionary Armed Forces of Colombia (FARC), the Castroite Army of National Liberation (ELN), and the pro-Peking People's Army of Liberation (EPL). By 1970 the army of 45,800 men consisted of 11 brigades, of which one was in reserve and one was stationed in Bogota, leaving 9 brigades available for tactical operations. The army was a disciplined force, with good professional leadership and a demonstrated willingness to fight. Its major weaknesses were in logistics and maintenance, areas in which efforts of the U.S. Military Group had been concentrated. Improvements were also needed in intelligence and troop mobility. The task of conducting military operations against the Communist guerrillas had fallen entirely to the army. The army was capable of mounting battalion size operations against the guerrillas and can contain the threat to the present acceptable level, unless outside support for the guerrillas increases significantly, or urban disturbances diverted army units to the cities. Only in a few recent instances have army troops been called on to help the police handle riots. Because of the success of the army against the guerrillas, and possibly also because the Government recognized that complete elimination of the guerrillas is beyond the army's capabilities, the army's counter-insurgency strategy appeared by 1969 to be shifting away from military operations and toward civic action in guerrilla-influenced areas. The theory appeared to be that, by establishing a government presence in those areas and demonstrating the government's interest in the people, support will be drawn from the guerrillas and they will eventually disappear. By 1988 the National Army was composed of 69,000 active-duty soldiers, including approximately 26,000 conscripts. The troops under the command of the National Army represented some 80 percent of Colombia's total military personnel. Approximately 500 of the army's troops were believed to be serving as military observers with the United Nations Peacekeeping Force in the Sinai. Between 1982 and 1987, the number of troops under the army's command remained relatively constant, possibly belying the army's recovery from personnel cuts that some sources allege were imposed during the mid-1980s. But in 1988 a significant increase (12,000 personnel) occurred. In addition to regular personnel, the army reserves (made up of persons who had fulfilled their military service obligation) added another 100,000 men to the army's potential manpower. Observers believed, however, that the service had limited capability to mobilize these reserve personnel in the event of a national emergency. By 1988 plans for a major restructuring of the army had been carried out. The restructuring included the reorganization of the service into four divisions and the formation of two new infantry brigades, which brought the total of infantry brigades to twelve. The troops assigned to these infantry brigades were dispersed among the country's ten military regions. Each of the four army divisions had territorial command over two to three of the country's military regions and was organized into three brigades. Each brigade had a minimum of two infantry battalions and one service battalion. Most of the brigades were composed of three infantry battalions, one mechanized cavalry group, and one battalion each of artillery, engineer, and service personnel. In all, the four divisions commanded thirty infantry battalions, six mechanized cavalry groups, eight artillery battalions, six engineer battalions, twelve service battalions, and two military police battalions. A thirteenth brigade -- which represented the restructuring of the Military Institutes Brigade (Brigada de Institutos Militares -- BIM) -- was established as an army-level combat formation and was headquartered at Bogotá. This brigade included troops from the First Airborne Battalion (the army's sole paratroop unit); the infantry, cavalry, artillery, engineer, and combat support services applications school battalions; and personnel belonging to the Lanceros Battalion. Troops in the Lanceros Battalion received special antiguerrilla training and assignments comparable to those of the United States Army's Rangers. The Logistic Support Brigade, made up of the Supply Battalion and the Ordnance Battalion, also was an army-level formation with headquarters at Bogotá. In addition, four battalions under the direct command of the National Army's headquarters included the Presidential Guard Battalion, the Leticia Mixed Jungle Battalion, the Nueva Granada Antiaircraft Artillery Battalion, and the 11th Military Police Battalion. The San Jorge Mechanized Cavalry Regiment was also under army headquarters command. By the end of 2005 the army had seven divisions assigned to territorial regions, and an eigth division was organized in 2011. The divisions were organized into brigades, which in turn comprise some 320 battalions. The Aviation Brigade is made up of a helicopter battalion, an aircraft battalion, and the army’s aviation school. The Army Aviation School (EAE), originally known as the Army Aviation Branch School, has been part of the brigade since 2003. The EAE moved from Tolemaida to Bogotá’s El Dorado International Airport in 2004. The army’s air capacity has expanded by more than 300 percent since 1999 as a result of aircraft contributions by Plan Colombia, even though the army’s fleet size has remained fairly constant (see table 5, Appendix). 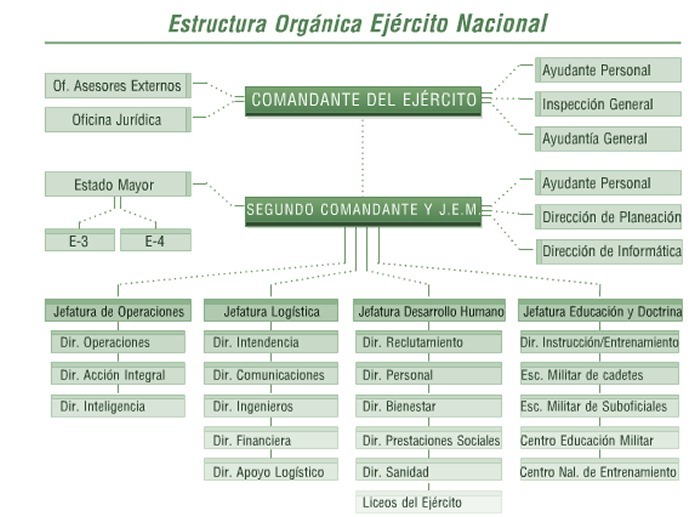 The Counternarcotics Brigade with four separate battalions, created as a part of Plan Colombia, also reports directly to the commander of the army. By October 2007, the army had 20 mobile brigades, each containing four counterguerrilla battalions of approximately 375 personnel each, with the capacity to undertake special missions in any part of the national territory and to engage in night operations. Six of these counterguerrilla units are special infantry battalions trained to operate in high-altitude zones frequently utilized by insurgents as strategic corridors. The first high-mountain battalion succeeded in driving the FARC out of its traditional stronghold in the Sumapaz region to the south of Bogotá. The Rapid Deployment Force (Fudra) is an elite counterinsurgent unit made up of the 1st, 2d, and 3d mobile brigades with their own transport capacity and air support. In 1996 the army formed the United Action Groups for Personal Freedom (Gaula), an elite force dedicated to combating kidnapping and extortion. There are 16 army Gaula units throughout the country, each composed of individuals trained to carry out rescue operations of kidnap victims and to dismantle criminal organizations. The Gaula units also include members of the DAS, the Technical Investigation Corps (CTI), the crime scene unit, and the Attorney General’s Office (Fiscalía General de la Nación). Plan Meteoro (Meteor Plan) units, which President Uribe founded in 2002 in order to reestablish security on the country’s roads and provide protection to motorists, also came under the General Command of the Military Forces.